On the surface, a quartzite arrowhead, a Gila monster, and vintage candy seem like a random assortment of objects to appear in the same exhibition hall, but they’ve all found common ground at the L.A. County Fair. The objects are part of The Rock Candy Factory, an attraction that blends the unlikely pairing of geology and candy based on their connection to Route 66, the theme for this year’s fair. 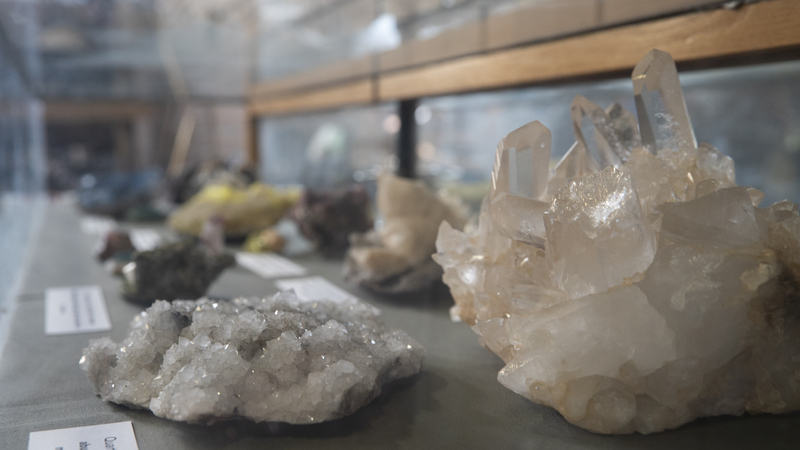 Much of the rock portion of the attraction has been supplied by the University of La Verne’s Cultural & Natural History Collections, a repository of artifacts, objects, and specimens that preserve and document our natural and cultural world. This is the second year that the University of La Verne has been asked to assemble an exhibit for the fair, Beardsley said. Last year, the Cultural & Natural History Collections displayed medical instruments and Renaissance-themed items for the Harry Potter’s World – Renaissance Science, Magic and Medicine attraction. As the theme for the 2018 fair came together, Fairplex officials asked if an exhibit in line with The Rock Candy Factory could be assembled, Beardsley said. Route 66, sometimes referred to as the Mother Road, stretched 2,448 miles and connected eight states starting in Chicago, Illinois, and ending in Santa Monica. The exhibit includes minerals, rocks, and clayware found in states along the famous highway such as colorful pieces of quartz from Illinois; quartzite arrowheads and tools crafted by Native Americans; pieces of pottery crafted by the Anasazi people of the southwestern United States; and even a preserved Gila monster, like those found in the southwest. The exhibit has been drawing adults and youth attracted by the colorful minerals. “They look pretty,” said Keane Shishido of Rancho Cucamonga, who visited the attraction with his mom, Joy Shishido. Shishido, who home schools Keane, said she found the collection interesting and a useful resource for an upcoming science lesson. The exhibit introduces the broader community to the university’s Cultural & Natural History Collections, which features a catalogue of more than 70,000 items covering thousands of years. The collections consist of artifacts donated to the university by alumni, trustees, members of the Church of the Brethren, and others over the university’s 127-year history. The collection has artifacts from the across the globe including textiles, Native American baskets, Asian and African figurines and instruments, articles of modern living, fossils, taxidermy animals, specimens from the La Brea Tar Pits, and much more. The Rock Candy Factory: The Science of Rocks & Candy attraction at the Los Angeles County Fair will be in Expo Hall 10 through Sept. 23. The Cultural & Natural History Collections are available for research and educational purposes by appointment. For information, email ulvcollections@laverne.edu.